Fujitsu recently announced the new ScanSnap iX500. The Scan Man likes this because it makes it possible to truly scan directly to the cloud with no effort. Read the announcement from Fujitsu and a review from Boing Boing. Sunnyvale, CA, January 7, 2013 — Fujitsu, the market leader in document imaging scanners, today introduced the newest addition to its award-winning ScanSnap product lineup – the next generation ScanSnap iX500 featuring built-in Wi-Fi connectivity giving customers the ability to scan directly to their Android™ and iOS compatible devices 1. Additionally, the ScanSnap iX500, for PC and Mac users, is enhanced with faster scanning speeds, a new advanced feeding system, an intelligent and customizable Quick Menu, and functionality allowing users to easily scan to cloud-based services such as Evernote, Google Docs™, Dropbox, SugarSync and Salesforce. Equipped with a revolutionary “GI” image processer 2 inside the scanner, the ScanSnap iX500 is now empowered for today’s ever-increasing on-the-go lifestyle and mobile professional. Now, users can instantly scan and transmit PDF or JPEG files, such as contracts, receipts, bills, invoices and business cards, to their mobile devices without the use of a computer. Utilizing the free “ScanSnap Connect” app on their mobile device or tablet, ScanSnap users achieve a whole new level of convenience in scanning; literally from the palm of their hand. With a simple push of a button, documents are scanned and saved to their mobile device ready to view, share or send to their favorite cloud service. The “ScanSnap Connect” app can be downloaded in the Google Play Store and the iTunes App Store and can be used with Android compatible tablets and smartphones running OS 2.23 and both the iPad and iPhone running iOS 4.3 or later. Faster Scanning Performance: Utilizing the increased power of its engine and “GI” image processor, the iX500 can create PDF files at speeds of up to 25 double-sided color pages per minute (300dpi, color) — that’s 25 percent faster than its predecessor. Advanced Document Feeding System: Inheriting the superior paper feeding technology driving the higher-end scanners from Fujitsu, the iX500 achieves exceptional feeding reliability using enhanced “Separation Roller” technology to maximize feeding reliability across an even wider range of documents and scanning situations. Customizable Quick Menu: For additional convenience and flexibility, the ScanSnap Quick Menu is fully customizable and automatically appears after scanning providing a quick and easy way to send those scanned documents to several popular “Scan-To” applications. Furthermore, the Quick Menu incorporates new intelligence that anticipates the appropriate application while keeping users in the driver’s seat for easy and faithful disposition of content. “ScanSnap Folder”: Stay in the moment and extend the power of one-button scanning into virtually any Windows application, even in the cloud, with the “ScanSnap Folder” function. This easy but powerful feature essentially replicates ScanSnap as a Windows folder which the user can open from their favorite software and web applications4 allowing them to scan into it without making complicated setting changes in ScanSnap or their application. It’s the ultimate in “Scan there!” versatility. Cloud Services Support: Users can scan documents directly to Evernote, Google Docs, Dropbox, SugarSync and Salesforce Chatter from their Mac or PC, giving them even more flexibility to store, share and access their paperwork. Whether it is scanning contracts, bills, invoices, or business cards on the road or using a PC in one place and a Mac in another, consumers have the necessary tools to be even more productive and paperless virtually anywhere. ScanSnap Manager (PC & Mac): Provides PC and Mac users one button searchable PDF creation, access to intelligent features and custom scan settings (profiles) for simple operation with sophisticated results. Scan-to Functions (PC & Mac): Offers users a flexible way to manage PDF, searchable PDF and JPEG files, providing them with an easy way to scan to a folder, attach scans to an email, send scans to a printer, as well as to a variety of cloud-based repositories like Evernote, Dropbox, and others. Efficient Business Card Scanning (PC & Mac): PC users can capture a business card, extract the information automatically and export it to Outlook, Excel®, Salesforce and other contact management software. While Mac users can conveniently scan their business cards and export the contact information directly to Address Book or Outlook for Mac. ScanSnap Organizer (PC): Offers PC users a convenient way to store, manage and view PDF and JPEG files as well as perform post-scan editing, keyword entry and searchable PDF conversion. ABBYY FineReader for ScanSnap (PC & Mac): ABBYY FineReader for ScanSnap™ allows users to be productive by quickly transforming their paperwork into editable Word®, Excel and PowerPoint files at the push of a button. Intelligent and Convenient Document Processing: Comes loaded with a full suite of intelligent scanning features, such as automatic paper size and color detection, automatic de-skew, orientation, and blank page detection & deletion, and the ability to scan a document up to 34 inches long, to support a wider range of documents. The Scanner is also equipped with a 50-page automatic document feeder (ADF). Paper to Digital at the Push of a Button:The ScanSnap iX500 comes bundled with Adobe Acrobat X Standard for PC allowing users to quickly transform their paperwork into editable documents at the push of a button. Post Scan OCR for Mac Users: The ScanSnap iX500 comes bundled with ABBYY Fine Reader Express for Mac which quickly turns any scanned paper document or PDF file into editable and searchable formats while keeping the original layout intact. Rack2-Filer Smart (PC): Rack2-Filer Smart comes bundled with the ScanSnap iX500 Deluxe model and enables PC users to organize their digital files into graphical e-binders and virtual cabinets. The Fujitsu ScanSnap iX500 is available now for $495 (U.S. list) through Fujitsu authorized resellers and mail order catalogs. The ScanSnap iX500 Deluxe Bundle is now available for $595 (U.S. list). 1 The ScanSnap iX500 and mobile device must be connected to the same Wi-Fi network to allow scans to be sent to the mobile device. 2 The “GI” processor was developed by PFU Limited and is equipped with a dual-core CPU-mounted processor supporting Wi-Fi and USB3.0 interfaces. 3 Fujitsu does not guarantee that ScanSnap Connect will work on all devices running Android OS 2.2 / iOS 4.3 or later. Please check the ScanSnap Android and iOS device support page for the latest information. 4 ScanSnap Folder is a Windows only function and is intended for cloud services and software applications capable of data uploading/attachment of PDF and JPEG files. 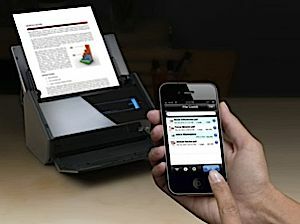 For the last several years I’ve been using a Fujitsu S1500 ScanSnap scanner to digitaly store all my paper documents. As I’ve said before, the ScanSnap truly was a life changer for me. I had no idea that a sheetfed scanner could be so convenient, fast, and reliable. It accepts up to 50 sheets of paper, scans both sides, performs optical character recognition on the text, and uploads the records to Evernote (or other cloud service such as SugarSync, Google Docs, or Dropbox). It automatically detects if the document is in color, and determines the page size and orientation. It discards blank pages. It also has an ultrasonic sensor that can detect and warn you if more than one sheet goes through the scanner at the same time. At CES this year Fujitsu announced its newest model, the ScanSnap iX500. Fujitsu sent me an evaluation unit, and I’m impressed with the improvements on a product I already loved. The iX500 represents the sixth generation of the ScanSnap line and it’s as close to being a perfect scanner as I can imagine. The first improvement is speed. I was perfectly happy with the S1500’s 20 double-sided pages per minute (PPM) rate. AT 25 PPM the iX500 is 25% faster, but the most notable difference is the vastly reduced latency between the new model and the earlier one. When you press the scan button the paper almost immediately goes through the scanner. The previous model had a slight delay between each sheet of paper, but this one has no discernible delay. The pages whip through without pause. One of the major enhancements to the iX500 is its much-touted wireless conductivity. You can now scan a document by installing an app on your iOS or Android device and touching the scan icon on the device’s display. The ScanSnap will convert the document to a PDF or JPEG that goes directly to your iOS or Android mobile device, even if your computer is turned off. I can’t say that I will use this feature frequently, but it may come in handy if I need to scan something and run out the door with it on my mobile device. The iX500 also has a new feeding and paper separation system that was originally developed for Fujitsu’s high-end industrial scanners. It has two gripper wheels instead of one, and from my experience so far, papers seem to go through more smoothly, and I have not yet encountered a paper jam. At $467, the iX500 doesn’t come cheap. But when I think of how much time I’ve saved by not having to file and look for paper documents, it’s a great deal.